Dr. Faustus...or, who took the cult out of culture? Reading Thomas Mann's "Dr. Faustus: The Life of the German composer Adrian Leverkühn, told by a friend" was a seminal event in my life. Now, I enjoy the occasional turgid and difficult read as much as the next girl, but that book sat on my bedside bookshelf for many a year before I dared crack it open. Mann's reputation as a dense and complicated writer frankly scared me off. At some point I gathered my courage and opened it up, though, and was immediately captivated. I'm fairly certain that had I read this novel as an undergraduate, I would have elected to become a Thomas Mann scholar. Mann manages to speak about music, the music I've immersed myself in as a violist/chamber musician/classical musician, in a way that ties together the personal, the political and the philosophical while spinning a harrowing yarn of choices gone wrong. Of course, our hero strikes the Faustian bargain: twenty-four years of unheralded compositional brilliance in exchange for his soul. I don't feel a spoiler alert is required here. Tomes have been written analyzing this work, and this blog post is not going to pretend to be a scholarly contribution. There is, however, an observation that I've been wanting to make. One facet of the book focuses on the isolation of the creative artist in Western culture. Beethoven, Goethe, Schoenberg and van Gogh would all be fine examples of this. The individual generative artist who lives apart from society to a certain extent, imagining worlds, in touch with the muse, but a tortured soul regarded as strange and "other" by his neighbors. There is a wonderful diatribe in Dr. Faustus about how music became divorced from tradition over the years culminating in late 19th/early 20th century Europe, particularly in Germany. A secondary character, a musicologist, expounds on how the "cult", meaning our deep religious, physical, social sense of connection through collective ritual and celebration was gradually erased from "culture" - rendering the musical arts an experience associated with thought, aesthetics, philosophy and high-mindedness (whatever that is!). 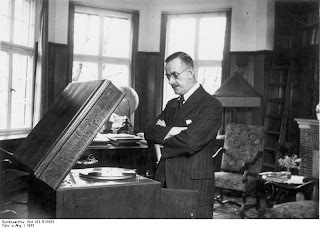 The musicologist bemoans not only the loss of deep-rooted connection to a common experience, but also the tragedy of the individual composer's experience - cast away on his own deserted island of creativity. Who took the cult out of culture? The book becomes an elegy on the downfall of German culture in the 20th century through which we can appreciate the tragedy of the German people and Nazism, and not just the horror. I recently watched Werner Herzog's stunning "Cave of Forgotten Dreams" on my computer (therefore, sadly, no 3D for me). This brilliant film is not only about the gorgeous cave painting in the Chauvet Caves of France, but is a meditation on the human experience circa 30,000 years ago. There are beautiful dialogues with the archeologists who painstakingly research the artifacts and paintings in and around the caves and lovingly immerse themselves in imagining lost worlds - seeking to connect with states of mind from pre-history. One of the scientists recounts a latter-day experience with an Australian aboriginal who leads him on a tour of rock paintings around the Australian Outback. The aboriginals, whose artistic methods had remained unchanged since the Stone Age until around the 1970's, were in the habit of restoring colors and damaged bits of paintings when they happened upon one another's work. As the scientist and the aboriginal encountered a painting in need of fixing and the man set about his work, the scientist asked him what he was painting. The reply: "I am not painting; it is the spirit who is painting." This is such a beautiful example of shared spirit, a so-called "primitive" awareness of connection to the muse. We, in Western culture, are hungry and yearning for commonality. There's a lot to recover. On a side note, flutes made from bone have been found at these French archeological sites. When replicated, they are found to play a pentatonic scale. I am imagining 30,000 year old pentatonic melodies and time is melting away. Cellist and composer Ernst Reijseger composed the deeply moving score to Herzog's film. "Cave of Forgotten Dreams" is worth listening to as much as being watched. Here's about fifteen minutes of live performance from the score. This music sounds as modern as it does ancient. Butch Morris and the anacrusis. A little over a year ago I met one of this earth's great musicians, Lawrence D. "Butch" Morris. He's also a fine example of a human being. He's the kind of guy who always carries a little notebook around and writes down his ideas as they hatch, for future reference and sharing. Butch has been a cornetist, composer, Vietnam vet...and since 1985 has led "Conduction" gatherings. I had the great musical privilege of working with and learning from Butch in his Seattle workshop and performance at the Cornish College of the Arts. Conduction, a term he coined for musical purposes, is a means of guiding a group improvisation. Not limited to dynamics and speed, he has invented hand gestures that can capture melodic material, indicate accompaniment and set up a structure involving development and repeats. I believe there are five different kinds of repeats! 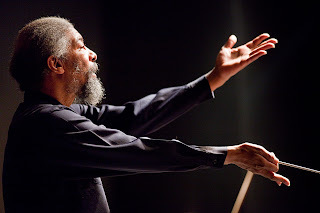 Butch resides in New York and works with certain musicians there, but he also travels the world leading mixed groups in his Conduction workshops. By mixed, I mean that he prefers to assemble folks who wouldn't normally be in an ensemble together: orchestral players alongside jazz musicians alongside rock drummers, folk singers, accordionists, you name it. "As musicians, we all share a common language. We may speak in different dialects, vocabularies, categories or styles, but the language is music. Whatever the tradition from which it springs, music has certain intrinsic properties beyond harmony, melody and rhythm. Although these properties may ultimately resist analysis, music will always allow musicians to communicate from vastly differing perspectives." His aim is to get everybody off their normal musical modus operandi and move toward truly listening and responding. To let go of the big solo jazz ego. To get away from the virtuosic lick. To depart from genre-based clichés. Butch considers himself to be the improviser and the ensemble to be the instrument. You might be tempted to think that sounds a lot like Gustav Mahler's monomaniacal vision of himself as the artiste before the music workers o' the orchestra, but because Butch's system of gestures invite each individual to develop their own idea, including choice of pitches, rhythms, inflections, etc. within the designated structural framework a creative environment ensues where Butch is not dictator but leader, and the musicians are organized in a way that propels them beyond ego to common cause. Even as some players are designated soloists and others accompanists. The thing is, you never know in advance which you might be. So what about the anacrusis? Here's a Merriam-Webster definition of anacrusis: "one or more notes or tones preceding the first downbeat of a musical phrase." In other words, a pick-up note, or notes. In Butch's parlance, though, the anacrusis becomes an extended means of making shape and expression within the phrase. The implementation of an anacrusis indicates the musician's awareness of gathering up energy to point to the arrival in a phrase...a phrase that they are inventing on the fly. So that improvisation is not a matter of "let your fingers do the walking" as my good friend Philippe describes it, but an immersion in the shape of space, with docking stations, flight paths and all that built in. In other words, how you start, where you're going and what you do when you get there. Sounds like a winning formula for making a phrase come alive, and one that classical musicians and teachers could have a lot of fun with. The anacrusis talk got me thinking about the term 'appoggiatura', too, and I'm developing my own definition for the musical implications of leaning. But that is for another post and another day. By the way, my Seattle colleague, the stunning violinist/composer/dancer/improviser Paris Hurley, who also played the Cornish show back in 2010, blogged about Butch on the Degenerate Art Ensemble's website as a guest writer - post from 23rd Nov. 2011. Addendum, post-publication: HERE is a BBC news clip where you can hear Butch talk about Conduction and see him explain some of the gestures to a group of musicians who have sheet music in front of them - a rarity in the scope of his performances.